Block Summer Rays – Nothing is more important than wearing sun protection daily. Ideally, use sun block with zinc and aloe. This will give your skin extra anti-inflammatory protection it needs plus Aloe prevents irritation. Rhonda Allison eZinc Sun Protection provides a physical block with anti-inflammatory treatment from the zinc. Also Rhonda Allison Daytime Defense SPF30 for total block protection. 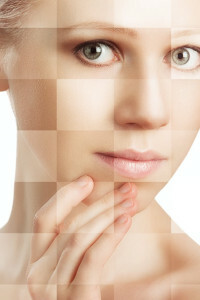 Combat Aging – Studies reveal sun damage and exposure accounts for 90% of skin aging. Defend yourself with products that contain antioxidants such as Vitamin C, E and Resveratrol, which help combat free radicals created by the sun’s rays. Rhonda Allison Antioxidant Complex Serum and Therapy E Serum is just the weapon to stop summer damage. Stay Hydrated – While 40% of women apply moisture 3 times a day, few hydrate their skin with Heavy Water, or D20. It is 10% heavier than H20, research shows D20 stays on the skin longer, giving “plumping effect” helps protect against ultra violet radiation and inactivates certain acne bacteria. This makes D20 ideal for oily and blemish prone skin as well as an “any time” moisturizer. Rhonda Allison Cucumber Spritz is all you need to plump up the skin and smooth summer lines. Stay Flawlessly Clean – Deep cleansing the skin works wonders on prevention of nasty summer breakouts. Using cleansers that contain AHA or Beta Hydroxy acid will help to break down the residue and unclog pores. Rhonda Allison Beta Green Tea Cleanser prevents the breakouts of summer. Exfoliate to Radiate – Excess heat brings with it excess sweat and oil to clog pores. Exfoliating daily with a gentle exfoliation bead, not a brush, will help remove grease and dirt, reduce dryness, boost circulation and improve performance of a product application. Rhonda Allison Clarifying Beads is gentle enough to use daily to enhance your summer glow. Lubricate Your Skin From the Outside In – Intense summer heat can create oil deficiency. To create supple skin, add an oil 2 to 3 times a week to your regimen. The oil will soften dehydration lines and smooth skin. Rhonda Allison Grape Seed Hydrating Serum is an enriched oil wonderful for all skin types. At Privy Skin Care we know firsthand the many skin care woes of living in the desert. Use the tips above and schedule regular facials to keep the signs of aging at bay. We enjoy helping you discover what home care products will best meet your needs! Call 702.496.2066 for a consultation, or click the “Schedule Now” button to make your appointment today. We look forward to talking with you!